That deflector looks absolutely pro! Great work sir! txsmkmstr wrote: LOL.... I was waiting for you to chime in. So after nearing a month, how are things with this cooker? How is fire management coming along, etc.? Honestly, between the insulated firebox, the tuning plates, and an inaccurate temp gauge I've struggled to have carefree offset cooking. The food has been fantastic - no issues there. The tuning plates are now getting closer to being correct, the temp gauge issue will be resolved soon, and on my last cook I changed some fire management habits that were making things much more work than necessary. Last weekend's brisket cook was the easiest by far - no spiking temps, steady burn rates, no fiddling with damper settings - starting to get the hang of this one. The LSGz design is spot on and the operator is getting there. txsmkmstr wrote: Honestly, between the insulated firebox, the tuning plates, and an inaccurate temp gauge I've struggled to have carefree offset cooking. The food has been fantastic - no issues there. The tuning plates are now getting closer to being correct, the temp gauge issue will be resolved soon, and on my last cook I changed some fire management habits that were making things much more work than necessary. Which gauge is inaccurate, the door gauge or your digital? I have been using a door gauge from my old pit, but on my grill grate in the OK Joe. The difference between my door and grill grate isn't that far off at 250-300 deg. Once i'm stable in that range, they're at about 20 deg different. Anywho.. I started rambling lol. I was getting to the point of me using a separate gauge anyways. Since you have the digital, I presume you're primarily monitoring that one and it is the one experiencing issues. Txdragon wrote: Since you have the digital, I presume you're primarily monitoring that one and it is the one experiencing issues. Actually, the door gauge is reading 15-20 degrees low when compared to three other gauges and the boil test. Doesn't sound like a lot but it caused me to build too large of fire - I really thought that gauge would be the most accurate. txsmkmstr wrote: Actually, the door gauge is reading 15-20 degrees low when compared to three other gauges and the boil test. Doesn't sound like a lot but it caused me to build too large of fire - I really thought that gauge would be the most accurate. It may be true, even when given the boil test; It's odd that the door gauge would read lower. Maybe something to do with the tuning plates placement in relation to the temp gauge; is there a plate directly under it, or is it right above a space between 2 plates? My guess would be a plate under it. So all the previous modifications were basically add-ons to a very nice pit. After several cooks I've got the tuning plates largely figured out, fire management is a breeze and the food has been fantastic. One area I think LSGz could have done much better was the "L"-handle to the firebox. The cool touch spring slides back and forth about 1.5" creating a pinch point and a somewhat sloppy feeling. I fixed this with a 3/8" flat washer - drilled out for the 1/2" "L"-handle and welded it in place. 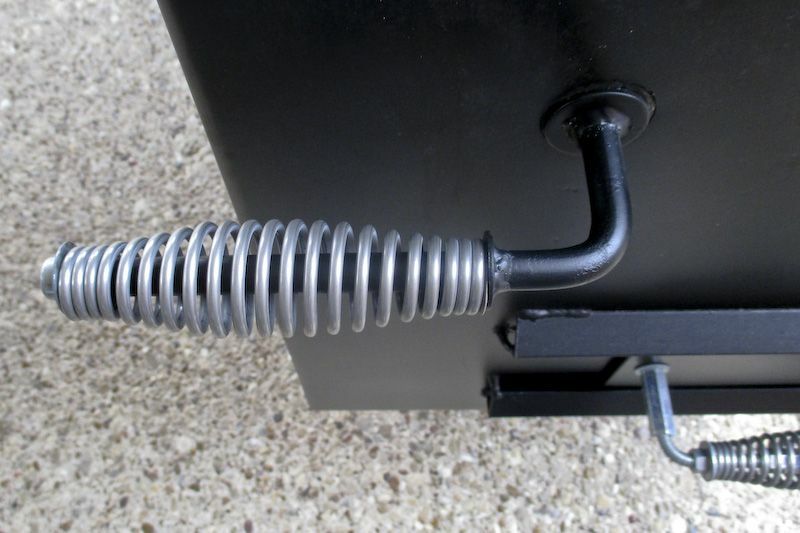 When the end cap was tapped back on it compresses the spring slightly and gives a much better look and feel. I also ground the spring ends so the taper was perpendicular to the handle in similar fashion as the intake damper modification made earlier. Having cooked with this arrangement I can confirm the spring still stays cool with no heat buildup. Here's a picture of the finished mod... 15 cent washer and a little touch up paint is all it took. The other thing I didn't like was how the handle would drop straight down and "hide" behind the door when adding a log. 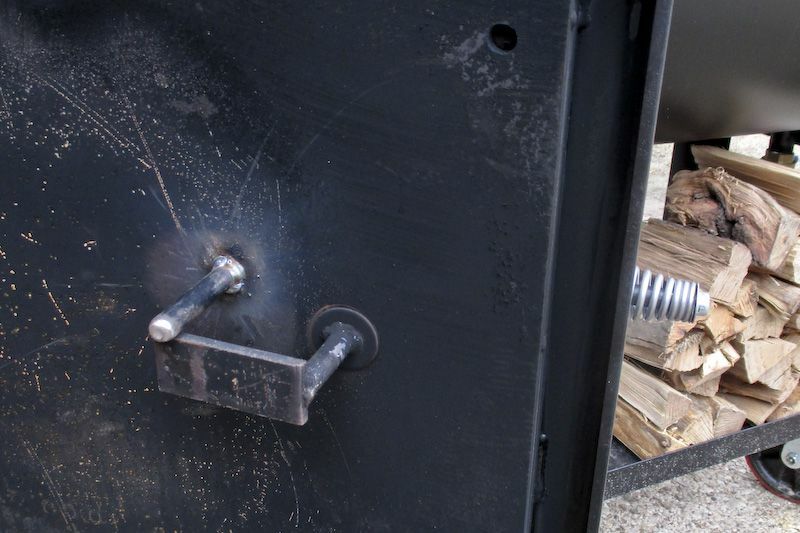 A simple stop (1/2" rod or similar) was welded in place on the inside of the door. This allows for the handle to rotate 180 degrees and stick out beyond the edge of the door instead of dropping straight down. Now the door can be closed without reaching or walking around to the other side - making it less likely to accidentally touch a hot door. Here's a picture right after welding the stop in place. I rounded the end for more finished look. The nice thing is you can still have the handle drop straight down if you want even with the stop in place. An option would be to have LSGz weld a nut on the door and you could supply a 3" long bolt to thread into it. That way if you didn't want that option you could remove it. Mine is there to stay for sure - again, a cheap addition for some great convenience. txsmkmstr, I'm getting close to pulling the trigger on one of these bad boys, just waiting on a fat stack of Fantasy Football money to come through! Are their leadtimes still around 16 weeks? Trying to get setup for an 80th B-Day party at the end of April. I may be too late already! jammoney wrote: txsmkmstr, I'm getting close to pulling the trigger on one of these bad boys, just waiting on a fat stack of Fantasy Football money to come through! Are their leadtimes still around 16 weeks? Trying to get setup for an 80th B-Day party at the end of April. I may be too late already! I'm sure the lead times are even longer - mine was 18 weeks and even then that was to the start of fabrication. I will say they did maintain the promised schedule. I'd call them and inquire - note that actual lead times are based on when they receive the deposit money. Awesome... You're gonna love it. You've pretty much hit the highlights on options. I would go ahead and get the ball valve on the grease drain. The only other consideration would be the counter weight but it may not be necessary. I assume you played with the floor model... Those doors are heavy. Looking forward to updates. You should order a longer model. Bigger is better on that style. Thanks for the advice. I haven't actually seen one of the pits in person. Im in CA and reputable pit manufacturers are rare out here. I did do about 30-40 hours of research over a few months. Read all the reviews/videos and settled on the LSG. I talked to Chris about the counterweight and he didn't seem to think it was necessary being that the door in only 36". It would be nice but since I'm already way over budget ill probably pass on it. I was however going to get the ash pan until I saw your cleaver idea. Hows that working out?